According to the Centers for Disease Control and Prevention (CDC), more U.S. citizens died from drug overdoses in 2014 than any year since the Atlanta-based government agency first began collecting such data. Approximately 78 Americans die from an opioid overdose each day. Of the estimated half a million Americans who died from a drug overdose between 2000 and 2014, 6 in 10 overdosed on opioids. The disturbing fact is that while the CDC estimates the number of opioid prescriptions have quadrupled since 1999, there has been no overall change in the amount of pain reported by Americans. At the same time, deaths from prescription opioids —such as hydrocodone, methadone, oxymorphone and oxycodone — have also increased four-fold since 1999. Purdue’s researchers knew even before OxyContin was available on the market that the 12-hour, pain-free claim was not necessarily true, and since the drug’s release in 1996, doctors, researchers and even the company’s sales reps sent similar complaints to the company. Realizing that, without this 12-hour advantage, OxyContin could not compete against other pain relief drugs on the market nor fetch its lucrative price, Purdue Pharma executives were determined to hold fast on this claim and urged even more aggressive marketing efforts and sales calls. Purdue instructed doctors to prescribe stronger doses of OxyContin, not more frequent ones, in the event patients complained that pain relief lasted less than 12 hours -- putting many patients at risk. And during the late 1990s, when more physicians began to prescribe OxyContin at shorter intervals, the company’s executives mobilized hundreds of sales reps to urge doctors to “refocus” on the 12-hour dose regimen. Purdue Pharma, which refused to participate with the Times’ investigation, has vigorously defended OxyContin and rebutted the Times’ article point-by-point; Ryan then picked apart Purdue's arguments in the newspaper’s reply to the company. A cauldron of events led to the the mass popularity of OxyContin and then the rapid increase in addiction. Before the mid-1990s, due to fears that they could become rapidly addictive, opioid medications were generally limited to treating symptoms for severe pain from terminal diseases such as cancer. At the same time, Purdue Pharma, owned by the wealthy Sackler family, needed a new product as its patent on MS Contin, another pain killer, was close to expiration. 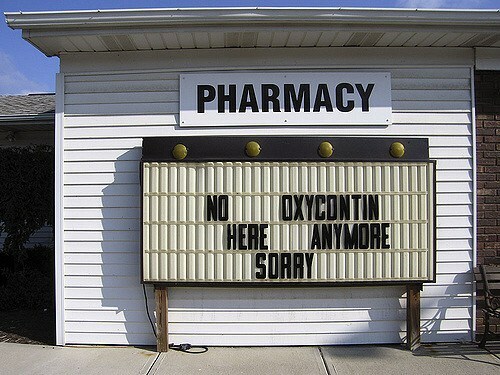 Upon the development of OxyContin, the company invested in a massive and aggressive marketing campaign, which even included music CDs and trips to posh resorts, in an effort to court doctors and convince them to prescribe the drug for conditions such as back pain. It was around this time that the Food and Drug Administration (FDA) loosened regulations on direct-to-consumer advertising, and the prescription infomercial was born. While Purdue Pharma only focused its marketing on doctors, its persistent tactics -- such as sending videotapes touting OxyContin and patient “success stories” to 15,000 doctors across the U.S. -- helped sales of the drug soar. Never mind the fact that some of those stories were dubious, and forget about the Purdue Pharma executives paying $600 million in fines because of misleading statements to patients, doctors and regulators about OxyContin’s effectiveness and safety. Last year the Sackler family edged into Forbes’ list of the wealthiest American families, edging out the Busches, Mellons and Rockefellers. But while the Sacklers have scored a massive financial windfall, its affects on families and communities, especially in rural America, has been devastating. Some have placed blame on doctors, with prosecutors focusing on shutting down the “pill mills” that have allowed many citizens to become addicted to painkillers. The CDC has suggested that insurers are paying far too much of these opioids’ costs, and that they should take measures to help reduce the number of prescriptions and, hence, risk of overdoses. Finally, the FDA -- bruised as it is clear its lax oversight contributed to this crisis -- is now considering a mandate that would require physicians to undergo risk training so that they become more judicious when prescribing opioids. But the question is how to pay for such physician training, and then there are the patients. While drug rehab poses its own share of controversies and criticisms, it is clear society that has to find solutions, as we are all paying for this health scare one way or another. Considering how pharmaceutical companies such as Purdue Pharma have reaped billions of dollars over the past 20 years thanks to their marketing campaigns, it is time for these firms to step up. They must acknowledge the overwhelming statistics that clearly link these drug manufacturers to this ongoing epidemic, and pay their fair share for education and treatment to help the U.S. overcome this public health disaster. The American Medical Association has called for a renewed ban on direct advertising by pharmaceutical companies; that money, along with funds used to "educate" doctors, could be diverted for other uses in an effort to heal society.